Overview The term ‘personality disorder’ is frequently used in clinical practice to describe individuals with pervasive difficulties in interpersonal functioning, self-concept, emotional regulation and behaviour. Difficulties in personality functioning are potentially disabling conditions and are associated with significant distress and interpersonal difficulties. Self-harm/ self-injury: Refers to people deliberately hurting their bodies and is often done in secret without anyone else knowing. The impairments are not better understood as normal for an individual’s developmental stage or sociocultural environment. Most common and most common to present is borderline personality Disorder. Borderline personality disorder is a severe mental disorder that has its onset during adolescence and emerging adulthood. It affects up to 3% of the population and occurs almost equally among males and females. Borderline personality disorder is Cluster B.
Borderline personality disorder is a severe mental disorder that has its onset during adolescence and emerging adulthood. It affects up to 3% of the population. Borderline personality disorder are thought to result from the impact of trauma and neglect in early development on vulnerable individuals. Onset occurs in adolescence or early adulthood. The impairment from the disorder is greatest in young-adult years and gradually wane with advancing age. During the 30s and 40s, the majority of individuals attain greater stability in relationship and vocational functioning. After about 10 years many as half no longer have pattern of behavior meeting the full diagnostic criteria. Remember Drugs should not be used as primary therapy for borderline personality disorder, because they have only modest and inconsistent effects, and do not change the nature and course of the disorder. Dialectical Behavioral Therapy Integration of CBT with mindfulness, acceptance and techniques to tolerate stress and control emotions. It teaches skills to control intense emotions, reduce self-destructive behaviours and improve relationships. Four skill that are taught in DBT: 1. Mindfulness, Distress tolerance, interpersonal effectiveness and emotional regulation. Remember All clusters worse under stress, especially interpersonal. Overview Suicide is widespread across many age groups, and is associated with mental illness such as depression and other factors. Suicide is likely to be under-reported as deaths from suicide may be difficult to distinguish from accidental or intentional injury. It is important to note that suicide attempts are up to 20 times more frequent than completed suicide. Side note Suicide among medical practitioners is higher than other professional groups in many industrialised countries, especially among female doctors. Risk factors for suicide are the same as the general population, however there is greater knowledge about how succeed and the availability of methods which may contribute to relatively high suicide rates. Mental illness: A term referring to a group of conditions that significant affect how a person feels, thinks, behaves, and interacts. 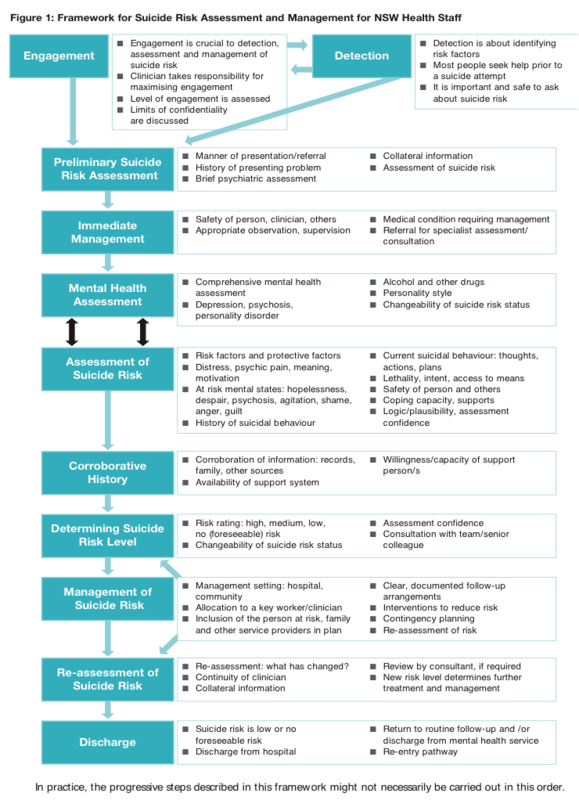 Suicide risk assessment – Important to complete when dealing with all patients who have mental health problems. The aim is to evaluate the likelihood of suicide attempt in the period of assessment.